Skin color is historically the locally adaptive trait most commonly considered by European cultures as a "racial trait" in humans. Skin color is an adaptation to the amount of ultraviolet (uv) radiation in the environment: dark skins are adaptive in high uv environments in order to protect from radiation damage that can kill and burn cells and damage DNA if not protected by melanin, and light skins are adaptive in low uv environments in order to make sufficient vitamin D, which requires uv (Hochberg & Templeton, 2010; Jablonski & Chaplin, 2010). The geographical distribution of skin color follows the environmental factor of uv intensity. Skin color differences do not reflect overall genetic divergence. For example, the native peoples with the darkest skins live in tropical Africa and Melanesia. The dark skins of Africans and Melanesians are adaptive to the high uv found in these areas. Because Africans and Melanesians live on opposite sides of the world, they are more highly genetically differentiated than many other human populations (Figure 2) despite their similar skin colors. Europeans, who are geographically intermediate between Africa and Melanesia, are likewise intermediate at the molecular genetic level between Africans and Melanesians, even though Europeans have light skins that are adapted to the low uv environment of Europe. Skin color differences in humans are not a reliable indicator of overall genetic differentiation or evolutionary history. Moreover, skin color varies continuously among humans in a clinal fashion rather than categorical ecotypes (Relethford, 2009). Hence, there is a compelling biological reason to exclude skin color as the racially-defining adaptive trait under the ecotype concept of race. Alan R. Templeton, "Biological races in humans," Studies in History and Philosophy of Science Part C: Studies in History and Philosophy of Biological and Biomedical Sciences, Volume 44, Issue 3, September 2013. 262�271. http://dx.doi.org/10.1016/j.shpsc.2013.04.010. 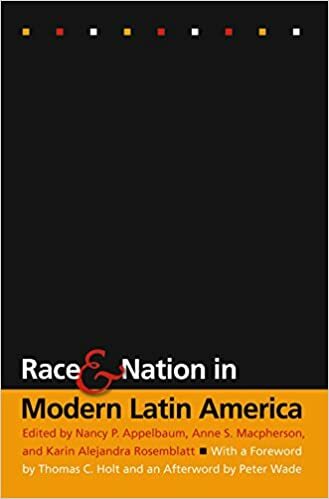 This collection brings together innovative historical work on race and national identity in Latin America and the Caribbean and places this scholarship in the context of interdisciplinary and transnational discussions regarding race and nation in the Americas. Moving beyond debates about whether ideologies of racial democracy have actually served to obscure discrimination, the book shows how notions of race and nationhood have varied over time across Latin America’s political landscapes. Framing the themes and questions explored in the volume, the editors’ introduction also provides an overview of the current state of the interdisciplinary literature on race and nation-state formation. Essays on the post-independence period in Belize, Brazil, Colombia, Cuba, Mexico, Panama, and Peru consider how popular and elite racial constructs have developed in relation to one another and to processes of nation building. Contributors also examine how ideas regarding racial and national identities have been gendered and ask how racialized constructions of nationhood have shaped and limited the citizenship rights of subordinated groups. The contributors are Sueann Caulfield, Sarah C. Chambers, Lillian Guerra, Anne S. Macpherson, Aims McGuinness, Gerardo Rénique, James Sanders, Alexandra Minna Stern, and Barbara Weinstein. “My housewife mother turned into a raging warrior woman when the principal of my elementary school questioned whether her daughter and the children of my public school had the intelligence to pass a citywide test,” Marta Moreno Vega writes in her essay. She knew then she was loved and valued, and she learned that to be an Afro-Puerto Rican woman meant activism was her birth right. The contributors span a range of professions, from artists to grass-roots activists, scholars and elected officials. Each is deeply engaged in her community, and they all use their positions to advocate for justice, racial equality and cultural equity. In their introduction, the editors write that these stories provide insight into the conditions that have led Afro-Latinas to challenge systems of inequality, including the machismo that is still prominent in Spanish-speaking cultures. A fascinating look at the legacy of more than 400 years of African enslavement in the Americas, this collection of personal stories is a must-read for anyone interested in the African diaspora and issues of inequality and racism. On July 20, 1740, King Philip V of Spain was given paperwork regarding a dispute over the adjudication of a notarial office in Panama City and, as usual, he was expected to make a decision. The king also had in hand recommendations from the Cámara of the Consejo de Indias. The king would have handled the case in a relatively straightforward manner, but for one fact—the two notaries involved in the public bid were of African descent. The notarial office (escribano público y del número) in question had been auctioned to Francisco Garcia y Robles, a white notary, for 1,525 pesos. A man named Jorge Geronimo Perez had also bid for it but lost, and was appealing the auction results on the grounds that the former owner of the notarial office had handed it over to him when the latter resigned. In addition, Perez argued, his long career in notarial service, including a time as assistant in the office of a notary, demonstrated his suitability for the post. To better assess his claim, the local authorities had required Perez to present documentation of his fiat (title of notary) and the dispensation of his defecto (defect), a document that stated he was of African descent—his grandmother was a mulata. However, Perez did not comply, and the case was forwarded to Spain. There, the Cámara and the king encountered a complication: the notary who had certified the auction was Joseph de Avellaneda, himself of African descent. To resolve the conflict, Philip issued a decree requesting that the two notaries of color present their fiats and dispensas de color o calidad (dispensations of color or calidad), both issued by the king, to the audiencia of Panama. If either refused to obey, he would be prevented from continuing to exercise his occupation. The decree also stated that the audiencia should not allow any mestizo or mulato to use the title of notary unless the king had provided him with an exemption for his defecto. This case highlights the existence of a seemingly contradictory reality. Although official imperial legislation prohibited notary positions to people of African descent, the monarchs and the Consejo de Indias—and not so infrequently—granted them individual dispensas to work as notaries and to own notarial offices. The case before Philip V did not represent an isolated incident. I have identified 42 individuals of African descent who worked as notaries in Panama between the early seventeenth century and the 1810s, and frequently they owned notarial offices as well. These 42 cases demonstrate the existence of an imperial practice that started with the Habsburg monarchs and developed under the Bourbons. I argue that this practice needs to be understood within Spain’s policy of flexible legislation, which allowed for adaptations to maintain its empire. It evidences an accommodative approach on the part of metropolitan authorities to the changing social reality in the Spanish-American colonies. The practice would ultimately be made official with the late-eighteenth century gracias al sacar decrees. This volume tells the story of two cultural groups: Afro-Hispanics, whose ancestors came to Panama as African slaves, and West Indians from the English-speaking countries of Jamaica and Barbados who arrived during the mid-nineteenth and early-twentieth centuries to build the railroad and the Panama Canal. While Afro-Hispanics assimilated after centuries of mestizaje (race mixing) and now identify with their Spanish heritage, West Indians hold to their British Caribbean roots and identify more closely with Africa and the Caribbean. By examining the writing of black Panamanian authors, Sonja Watson highlights how race is defined, contested, and inscribed in Panama. She discusses the cultural, racial, and national tensions that prevent these two groups from forging a shared Afro-Panamanian identity, ultimately revealing why ethnically diverse Afro-descendant populations continue to struggle to create racial unity in nations across Latin America and the Caribbean. The diaspora experience is characterized by hybridity, diversity and above all, difference. The nature of the diaspora experience therefore precludes an exclusive articulation of identity. Black identity in Panama is one characterized by this same multiplicity. My dissertation examines race, culture, and ethnicity in the development of Panamanian national identity and is informed by the critical theories of Paul Gilroy, Stuart Hall, and Frantz Fanon. The articulation of Afro-Panamanian identity is both intriguing and complex because there are two groups of blacks on the Isthmus: Spanish speaking blacks who arrived as a result of slavery (15th -18th centuries) and English speaking blacks who migrated from the West Indies to construct the Trans-isthmian Railroad (1850-1855) and Panama Canal (1904-1914). The country’s cultural and linguistic heterogeneity not only enriches the study of Panama and illustrates that it is a nation characterized by multiplicity, but it also captures the complexity of the African Diaspora in the Americas. This plurality is evidenced in Afro-Panamanian literary discourse from its inception in the late nineteenth century to the present. This study analyzes the representation of Afro-Hispanics and Afro-Antilleans during different time periods in Panamanian literature, the literature written by Afro-Hispanics, and the literature written by Afro-Antilleans which emerged during the latter half of the twentieth century. Finally, I address how the discourse of both groups of blacks converge and diverge. Panamanian literature has been grossly understudied. While its history, geography, and political ties to the United States have been examined extensively by intellectuals from the United States and Latin America, with the exception of a few studies, its literature has been virtually ignored by the Hispanic literary canon. Within the field of Afro-Hispanic literature, black Panamanian literature has also been understudied. With the exception of works published about Gaspar Octavio Hernández, Carlos Guillermo Wilson, and Gerardo Maloney, Afro-Panamanian literature has not been examined comprehensively. My dissertation seeks to fill this void in the field of Afro-Hispanic literature and, hopefully, it will enrich the field of Latin and Central American literature and literary criticism. In spite of having more fluid and flexible racial boundaries than other regions of the world, Latin America continues to have racially hegemonic practices. Panama has a myth of racial egalitarianism, yet an inability to perceive that racial inequality is pervasive. This is illustrated with the paradox of race relations between Afro-Antilleans and the indigenous peoples in the Archipelago of Bocas del Toro. Intermarriage in the region and the notion that there is no racial inequality contrasts with the constant recognition of differences. Race relations and ethnic identity in this region have their origins in the competition between British, North American, and Central American interests, and have been shaped in relation to Panamanian nationalism. This article analyzes 20th-century black identity in Panamá by examining how two distinct points on a spectrum of Panamánian blackness came to fit strategically (although sometimes contentiously) under the category ‘Afropanameño’ at the end of the 20th century. The dynamism of contemporary blackness in Panamá exists around the politics of Afrocolonial (Colonial Black) and Afroantillano (Black West Indian) identities as they have been created, contested, and revised in the Republic’s first century. This essay examines the major discourses that shaped ‘blackness’ in four key moments of heightened nationalism in 20th-century Panamá. I refer to these moments as: Construction (1903–1914), Citizens versus Subjects (1932–1946), Patriots versus Empire (1964–1979), and Reconciliation (1989–2003). On Friday 26 May and Saturday 27 May 2006, I witnessed the inauguration of the first ‘Festival Afropanarneno’ in the Panamá City convention center. Supported by the Office of the First Lady, the Panamánian Institute of Tourism and the Special Commission on Black Ethnicity, the event included 20 booths featuring black ethnicity exhibitions, artistic presentations, food and wares representing the provinces of Panamá, Coclé, Bocas del Toro, and Colón—the areas with the highest concentrations of Afropanarneño populations. As the Friday celebration drew to its apex, a special commission appointed by President Martín Torrijos in 2005 presented him with the fruits of their year-long endeavor: a report and an action plan on the ‘Recognition and Total Inclusion of Black Ethnicity in Panamánian Society’. Using public policy advances in other parts of Latin America and the Caribbean to bolster their case (such as Colombia’s 1993 Law of Black Communities, Brazil’s 1998 Body of Laws against Racial Discrimination, Nicaragua’s 1996 Law of Autonomy of the Atlantic Coast, and Peru’s 1997 Anti-discriminatory Law, 1997), the Special Commission built on the progress made through ‘El Día de la Etnia Negra’ [‘The Day of Black Ethnicity’] to open a wider space for the recognition of social, economic, and cultural contributions of black ethnicity to the nation-building process. Instituted into law on 30 May 2000, ‘El Día de la Etnia Negra’ is an annual civic recognition of the culture and contributions of people of African descent to the Republic of Panamá (Leyes Sancionadas). The date 30 May coincides with the date in 1820 when King Fernando VII abolished slavery in Spain and its colonies, including Panamá. Significantly, the law stipulates that the Ministry of Education and the Institutes of Tourism and Culture should organize relevant activities to commemorate the holiday, and that all schools and public institutions should celebrate it as a civic proclamation of ‘black ethnicity’ contributions to the culture and development of Panamá (Van Gronigen-Warren & Lowe de Goodin, 2001, p. 83). I have witnessed black ethnicity day celebrations in the cities of Panamá, Colón and/or Portobelo (located in the province of Colón) each year from 2000 to 2006 and have watched them grow from a celebration limited to 30 May to an informal, week-long commemoration, to its most recent form ‘El Mes de la Etnia Negra’ [‘The Month of Black Ethnicity’]. …Part of the animosity directed toward West Indians was caused by Canal Zone Jim Crow policies, which not only segregated West Indian workers as ‘black” and therefore inferior, but also constructed a blackness elastic enough for all Panamánian workers, regardless of ethnicity, to fit uneasily and resentfully alongside them. Although the system of paying salaried workers in gold and of day laborers in silver began under the French-controlled Canal, these labels took on racial connotations under United States control, which translated ‘gold roll’/’silver roll’ into ‘whites only’/’blacks only’. The article examines the conditions governing the interrelationship between Chinese and west Indians population with the Panamanians, especially in the first half of the twentieth century. In particular, the article presents the framework in which opportunities for integration and social and economic marginalization are provided, and how Panamanians actively discriminated, but so often differentiated, with respect to different groups of foreign immigrants. It remarks the relationship between merchants-economic sector in which foreigners were widely represented and the rest of the Panamanian community as well as among foreign traders between them, as belonging to one or another nationality. The political environment of Panamanian nationalist exaltation, which allows the intensification of discriminatory and even racist legal initiatives, is also examined in detail. It also illustrates forms of political participation of immigrants, and social and political alliances that generated. The West Indian and the Chinese communities have been present in Panama since the second half of the nineteenth century. Yet, as the aforementioned quotes show, both are still considered a menace to Panamanian identity. In this paper, therefore, I will explore the origins of the notion Panamanian identity in the way it was established by the nationalist movements of the 1930s. Even if the notion of Panamanian identity may have been present earlier, it were the nationalist debates of the thirties that fully developed and established the idea of Panamanianess in force until this day. This notion of Panamanianess set the parameters of who could and who could not be considered Panamanian. I will focus here in three different racial and ethnic groups the Chinese and the West Indian immigrants and in the Spanish speaking Panamanian blacks. The first two excluded and the last one included. Indeed, the “inclusion” of the Panamanian blacks was used to argue that Panamanian identity was not based on racial categories but on cultural ones. However, the notion of Panamanianess was not the only factor affecting the integration of this groups. Despite a shared exclusion, the Chinese managed to integrate better than the West Indians. A second component of this paper is to explore their economic and demographic differences that explain their dissimilar integration. Com­par­a­tive research on race and eth­nic­ity has often turned to Latin Amer­ica where racial iden­tity is seen as fluid. Using nation­ally rep­re­sen­ta­tive data from the 2010 America’s Barom­e­ter, we exam­ined the extent to which skin color, nation, class and region shape who iden­ti­fies as black or mulato in Brazil, Costa Rica, Panama, Colom­bia and the Domini­can Repub­lic. While racial cat­e­gories over­lap sig­nif­i­cantly, skin color largely deter­mines both black and mulatto self-identification in all five coun­tries although its effect varies con­sid­er­ably. We dis­cov­ered dis­tinc­tive pat­terns in racial flu­id­ity, in how color shapes racial clas­si­fi­ca­tion, in the fre­quency of black and mixed-race cat­e­gories, and in the influ­ence of sta­tus and region on racial clas­si­fi­ca­tion. We sug­gest that these pat­terns are related to nation­al­ist nar­ra­tives, state poli­cies and black move­ment orga­niz­ing. These find­ings chal­lenge widely held assump­tions about race rela­tions in Latin Amer­ica, sug­gest­ing rather that unique national his­to­ries have given way to dif­fer­ent sys­tems of race clas­si­fi­ca­tion in each coun­try. We advance the con­cept of racial schemas and vis­cos­ity to bet­ter under­stand these differences.